The shopping mall has been in a steady decline for a while. As of 2014, no new enclosed malls had been built since 2006. That’s a far cry from when the shopping mall reigned king. Yet, while shopping malls have hit some hard times, new shopping centers are still being built at a brisk pace. So why are shopping malls dying while shopping centers are thriving? Here is my theory. It’s no secret that online shopping has taken a big chunk out of traditional brick & mortar stores. It seems every year, online sales records are shattered. Cyber Monday 2016 was record breaking. I know I love shopping online when I have the opportunity. For me, as long as I can get what I want better or near the same price, I’ll buy online more often than not. I will even pay a little more sometimes. I figure my time saved in not having to go get the item (plus gas) makes up for the cost. In spite of more and more shopping being done online, people still go to stores. Parking lots still get full on busy days. Even throughout the year, there are some places that are always packed. I don’t ever see a time where physical stores go away. You’ll always have people that want to browse. There will always be items that simply don’t lend themselves to buying online. Some items are impulse buys and even drone deliveries will often take too long compared to buying something on the spot. You’re always going to have stores. any new ones. There are a couple that, while not struggling, are definitely showing some signs of stress. 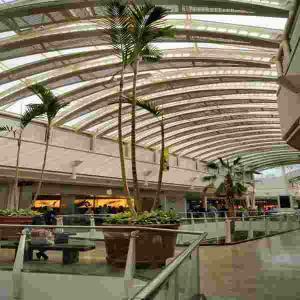 Renovation projects at nearby malls are infrequent and cosmetic. Meanwhile, shopping centers are still going up like crazy. Within just a few miles, it seems a new shopping center goes up every month and are full almost immediately. And, it’s not like older shopping centers are dying. My theory is that online shopping has taken enough of a chunk to where shopping at the store is no longer the event that it used to be. Back before online sales, if you needed to go out, you could make a whole day of it. Going to ten stores to buy all sorts of different things was not out of the norm. So, why not drive to one place and have it all right there for you? The mall was perfect for this. Now, with online shopping, people still need to go out, but they no longer need to spend all day shopping. Instead of spending a whole day shopping, they might need to just stop at one or two places. When having to run into just one or two stores, the mall suddenly becomes very inconvenient. Even if the frequency of these types of stops increases, meaning that people make more per month, people would still rather run in and out. Who wants to deal with parking, making a long walk in, having to walk all around a big mall, just to make one or two stops? Nobody. Everything that once made the mall the center of retail is now working against it. With all of this, can the decline of the mall be reversed? Who knows? I certainly don’t see any movement that would suddenly reverse the trend of online sales, but there could be something else to change the landscape. It’s hard to tell. I think that the stagnation of malls will continue. What you might see is that more and more malls will contract as they continue to age and owners realize that the cost of upkeep is no longer worth it. Big box retailers seem to be struggling, and as they traditionally act as anchors to shopping malls, this is an ongoing risk. As more big retailers close, the mall could die off quickly. Malls typically also take up many acres of real estate. Depending on the location of the mall, there might not be a big chunk of land, so a mall parcel could be very attractive. Think of all the houses that could be built. Or office buildings. Readers, how are malls doing where you live? Do you find yourself making less frequent visits than you once did? What are your thoughts on the future of the once mighty shopping mall? Should Kids Have Homework In Early Grades? I see the same thing in my market (about 250,000 people) and there is one very successful mall in a retail corridor, but there’s another one on the opposite side of town that went under, and another one that was downtown, but sat abandoned for about 10 years and only a couple years ago was completely demolished for new downtown renovation projects. Even the successful mall seems to have some vacancies which I never saw before, it was always 100% full years ago. I can’t imagine the days of double digit rent increases at malls are still the norm. Interesting. I wasn’t aware of this trend but it makes sense. There aren’t any good malls near me, so I never go. There are two malls – but both sub-par with vacancies and no real draw for me. Maybe if there was a “nicer” mall I still wouldn’t go. I haven’t thought about it. I do know that if Amazon has it, that’s where I get it. That’s my go-to for sure. I think that’s the case for many, which explains a lot! The latest thing in Silicon Valley is the residential shopping center – a series of blocks with retail stores on the ground floor and fancy condos on the upper floors, e.g. Santana Row in San Jose. Personally, I can’t imagine why someone would want to live on top of a shopping center, but apparently they do. That’s pretty common for downtown urban areas, but I guess there are people that want the feel without the density? Shopping malls are a hit here in our area. I think it’s because of the weather condition as it is hot and humid here, so people try to spend much time in malls especially in weekends. Now, there are more online stores but people here still prefer visiting stores. I noticed this, too. Strip malls are definitely overtaking the 90s-era shopping mall. My hypothesis was that it was a combination of the fact that many people don’t want to “hang out” at these places anymore (after all, there’s vidya to play) and most people’s preference for driving over walking, as you mentioned. Plus, malls are dominated by chain stores, and not particularly popular ones. They’re exceptionally expensive to run. And, of course, who can compete with online retailers that deliver right to your door? It seems like the anchor store + satellite shops are here to stay. That’s too bad because I could use the exercise, lol. Good point, haha! Though, to be honest, the best part of walking is the not-spending-money part. As much as I like to walk in a climate-controlled mall, I should probably stick to strolling around the neighborhood. I’m largely the same way, I think!